Preheat oven to 180°C. Place mushrooms on a baking tray, lightly spray with olive oil and bake until browned. Spread the pine nuts over a seperate baking tray and bake in oven for 5 mins or until toasted. Remove from oven and set aside for 10 mins to cool. Place the pine nuts, basil, garlic, nutritional yeast and salt into a food processor and blitz until puréed. Slowly add the oil until incorporated. 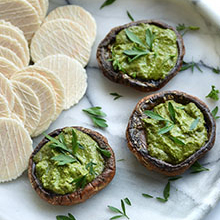 Spoon into mushrooms and enjoy with some ORGRAN Quinoa Wafer Crackers!